A correct bite and straight teeth will not only help you smile with more confidence, but they will also reduce the risk of future dental problems. When your teeth are straight, there’s a better chance of preventing plaque buildup, which commonly leads to gum disease. Cochran Orthodontics provides a wide range of orthodontic treatment options, which include traditional metal braces, lingual arch-wires, Invisalign trays, ceramic braces, partial treatments and removable appliances. When you come in for an appointment, we will discuss your options so you can decide the best orthodontic treatment for you. This decision will be made based on the degree of your dental misalignment, the severity of your bite and your desired outcome and preferred treatment time. 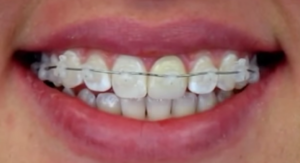 No matter which orthodontic treatment is decided to be best for your personal circumstances, your teeth will be straightened, your bite will be corrected, your appearance will be improved, you will have better health and feel better and more confident with a new straight, beautiful and healthy smile. Malocclusion, or a bad bite, is corrected by braces. A bad bite is often interrelated to crooked teeth, and braces can fix both issues simultaneously. Even if your teeth appear to be straight, your jaws could still not be properly aligned. If this is the case, Dr. Cochran will recommend treatment to avoid future issues such as extra wear to your teeth enamel, premature tooth loss, chewing and speech problems or more severe problems with your jaw. Your personalized orthodontic treatment will depend on what you need to have corrected, your preferences and the recommendation of Dr. Cochran and his team. Traditional or metal braces are composed of standard metal brackets and an archwire connecting all the brackets together. This type of brace has been the most common, and with new technological advancements, they are now more comfortable and sleeker. With metal braces, children and teens have the option of making their braces more vibrant, colorful and unique to their personality with colored elastic bands. Brace brackets don’t need to be metal. Clear braces are a fantastic option for adults that want less noticeable braces, as they function in the same way as traditional metal braces, but with translucent materials making up the brackets. Therefore, they are more discreet than metal braces, while still performing the same and giving you a smile you deserve. Clear braces can also be placed at the back of your teeth, making them nearly invisible to everyone around you. Invisible braces, also called Invisalign, are a clear set of custom-made removable trays that are fitted to your teeth. The pliable material fits tightly to your teeth, and each new set of aligners is slightly adjusted, to move your teeth into their correct place slowly. They are removable, which means you can take them out while brushing or flossing your teeth, and while you’re eating or drinking, so good oral health habits are easily maintained. All our patients have unique needs, and you may not need a full set of braces. Sometimes, only a few teeth need to be realigned, either to prepare for other dental work such as periodontics, dental implants or restorations. If this is the case, Dr. Cochran will recommend partial orthodontic treatment. If you believe you or someone in your family is a good candidate for one of our orthodontic treatment options, contact our office at 210.874.2508 to schedule your initial consultation and be on your way to a smile you can be proud of.